Stylish, Spacious, Luxury Retreat in the Heart of the Wine Country at Eliza's. A 3 bedroom light filled cottage with stunning views and a swimming pool. Luxury abounds at Eliza's - heavenly beds dressed in Egyptian cotton and goose down, spa quality toiletries, gorgeous waffle robes, flowers in every room and, for your own exclusive use, a swimming pool. The open plan dining and living areas leads out to a terrace, pool and an acre of manicured lawns and beautifully planted woodland creating the perfect environment to relax and socialise. You will be in the midst of Marlborough's stunning, world famous, wine region with all the well known wineries such as Cloudy Bay, on your doorstep. The stunning Marlborough Sounds is fifteen minutes by car and central Blenheim only five minutes away. Extensive media library of books, magazines and classic DVD's plus full Sky TV. The pantry and laundry is filled with all the necessaries to get you started. A newspaper is delivered daily. Our home made full country breakfast provisions are famous! A highlight is the daily delivery of a freshly baked loaf of farmhouse bread designed to complement the homemade jams and jellies. Many of the breakfast ingredients are directly sourced from the farm including the grapes that make the chilled bottle of wine awaiting your arrival. The kitchen has every item necessary for the serious cook including sharp chefs knives, stock pots etc. The pantry has all your basic necessities. In addition to the pool, the acre of garden and expansive lawn there is plenty of outdoor games, and loungers. The wood burner fire, with copious firewood and kindling, provides perfect winter warmth. The fire will be lit and awaiting your arrival in winter. In our hot summers the air conditioner can be very useful. An abundance of fruit trees including apples, peaches, nectarines, feijoas and every type of citrus are there for you to collect in season. 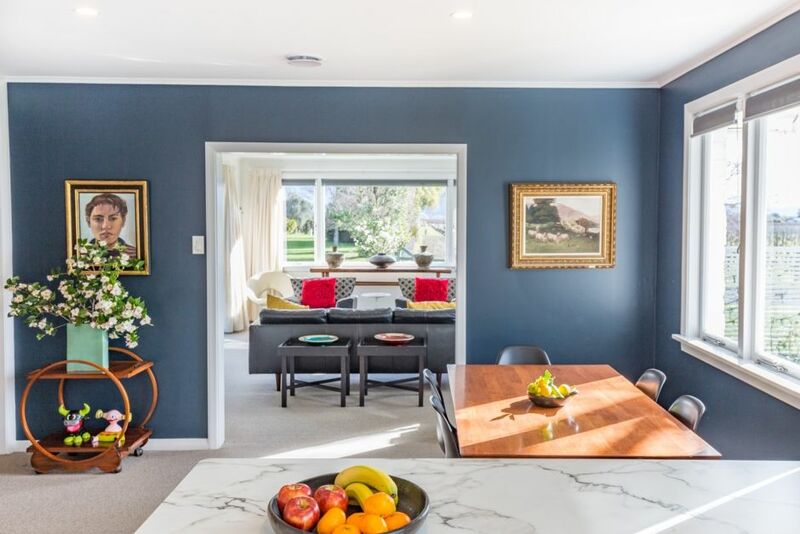 We live next door in the original century plus old farmhouse now restored for modern life which is surrounded by a 3 acre garden accredited as one of national significance by the New Zealand Gardens Trust. Our main business is growing grapes but we love the happy positive energy our holidaying visitors bring to the farm. We bought the next door farm and inherited a house that had been built for the granddaughter of the the couple that had built our house. This new house had an extensive garden that needed some renovating and a charming pool. It was just perfect for a holiday home. Over the years I have stayed in many holiday homes in many parts of the world and I have become rather opinionated about what makes this accommodation work well for the holidaymaker. It was great fun putting these ideas into action and creating my dream holiday home. However, uniquely, I have never stayed in my dream holiday home! We chose Marlborough to be our forever home nearly 2 decades ago. It has a great sunny climate and is filled with every outdoor activity imaginable which is important to us. There are stunning views in Marlborough and Eliza's has more than its fair share. The dramatic sunsets over the Richmond Ranges are a nightly pleasure. Eliza's is set in the midst of the Wairau Valley and over the vineyards the Richmond Ranges provide the perfect way to see the the dramatic light changes of our spectacular sunsets. It reaches 30 C plus (86 plus F) in summer - not everyday but often enough to find this useful. Fire, heat pump, electric fan heaters. Top notch cotton linens, goose down duvets and pillows. A large washing machine plus detergents at no charge. With ample firewood this wood burner will make you stay extra delicious. The kitchen , dining room and living room are open plan and spacious. The kitchen is new and all has been redecorated. A Nespresso machine (and capsules!) is here to make the caffeine addicts mornings . All the basic essentials from olive oil through flour to soy and fish sauce. We also stock a good selection of teas and coffees. Generosity is key here and if love cooking you'll love our chefs knives. The kitchen is fully equipped and reflects our passion for cooking. There is a good sized pantry and excellent quantities of crockery, cutlery, glassware, serving dishes etc. A dining table and six chairs. Full Sky TV including sports. We love books and just in case you're wondering what to cook tonight the excellent cook cooks will provide inspiration. Cards, monopoly, pictionary, cricket, petanque, and the devils game, croquet. Kids love toys and we love kids. I love classic movies - there is a big collection! Gardening is my passion and you'll appreciate that when you're here. Open the large new sliding doors onto the terrace, outside dining, BBQ and pool. This has to be our most popular amenity. The living room opens through large brand new sliding doors onto a terrace with al fresco dining complete with BBQ and your exclusive pool. Charming Light filled apartment in the heart of Lyttleton. We loved our stay here. The very tasteful apartment has everything you need with fantastic views of both the port and the hills. With great cafes and restaurants literally on our doorstep we loved experiencing the youthful vibe of this lovely part of Christchurch. Liam is a thoughtful host. It’s a very high recommendation from us. We really enjoyed our second visit to the cottage. The attention to detail and levels of comfort make this the ultimate 'home away from home'. Would definitely recommend. Great house with brilliant amenities situated in the most gorgeous garden. Perfection! Eliza’s Garden Cottage is a beautiful and immaculate place to stay. Wendy Palmer, the owner, has thought of everything to make the house comfortable. Vases filled with flowers, and delicious provisions make this a perfect place to relax and enjoy Blenheim. Thank you Ruth. You and David were the most perfect of guests. It was a true pleasure hosting you. I hope you had a great time in Napier and maybe we'll meet again someday. Besides being beautifully located within vineyards the cottage has one of the nicest gardens ever and an amazing view. The cottage has all the amenities you could ask for and everything is in its place and immaculately clean. The bedrooms are cosy and well appointed, as well as the rest of the cottage. Having travelled around New Zealand for the last two years and having stayed at numerous places, this cottage is definitely number 1 on our list. We are looking forward to staying there again!